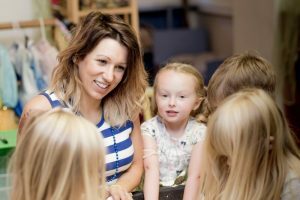 Maria has her Associates Degree in Early Childhood Education and has been a teacher at Playschool since 2010 when her middle son was still at Playschool. She and her husband Don have four children and one grandson. During the summer, Maria and her family usually spend a lot of time at the Jersey shore with her parents. 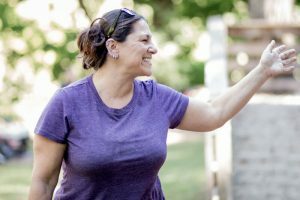 Maria loves spending time with her family, swimming, hiking, or just singing along to music at home. Life is never dull at the Pell household! Playschool has become a very special place for Maria, Don, and their kids. They have all made lifelong friends during their time at Playschool. In fact the boys still regularly see the friends they made in the Yellow Room! Erin’s teaching career began in Philadelphia after graduating from Temple University with a BS in Elementary Education and certification in Early Childhood Education. 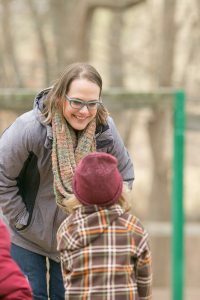 After teaching a few years at various Quaker schools she found herself at a small parent-run co-op called The Cooperative Nursery School where she fell in love with the aspect of parents and teachers working together as partners and the community that naturally evolved. After teaching at CNS for three years Erin and her wife Nancy were ready to expand their family, and motherhood opened up the opportunity for Erin to enjoy a few years at home with their two girls Addison and Grayson. During this time she got to experience being a helper herself while Addison attended CNS. This was a “full circle” experience and gave her much due respect and gratitude for the dedication parents put forth when participating in a cooperative school. When she went back to work after her maternity hiatus, Erin worked in the pre-k classroom at The Miquon School, a small non-profit progressive school in Conshohocken, PA.
Erin found Playschool in 2010 when she and her colleagues at CNS were researching other co-op schools, and they scheduled a visit as part of their professional development. Erin remembers loving what she saw here and wished she could have stayed all day. Soup was being made in the kitchen by a Dad helper, the work bench was an actual weekly occurrence rather than an idea and each classroom had opportunities to climb, swing and move! Aside from taking with many great inspirations Erin told her colleagues if her family ever moved to Phoenixville, that she would love to work there and have her children attend the school. After living in Philadelphia for 17 years they felt ready to make the move to the suburbs for a variety of reasons in 2017, and they love being in Phoenixville! Erin is very excited to have joined the Playschool staff and is equally excited for their youngest daughter Grayson to experience Playschool. When Erin isn’t at Playschool she enjoys spending time with family and friends. She loves being outside, hiking, and would love to get back into camping! She also enjoys exercising, reading and finding small moments of solitude. Amanda and her husband Brett have two children, one Playschool graduate and one still at Playschool. Amanda graduated from Penn State University with a degree in Elementary Education and after being one of our staff’s favorite classroom helpers, was hired in 2016 to teach in the Green Room with Maria. When Amanda isn’t with all of her awesome Green Roomers, she loves to dress other people up, paint pictures, tap dance like she did when she was nine years old, force her children to listen to every Broadway musical ever written, sometimes sing in mom bands and officiate weddings. Amanda grew up in Langhorne, Pennsylvania and married Brett from Danville, California; they compromised and now live in Phoenixville, PA. Amanda loves Charlestown Playhouse like her second family. All of her best friends came from this school and she loves everything that it stands for. Stop by and say hi to her anytime--she loves meeting new Playschoolers!